Jewel Spears Brooker - T. S. Eliot: Apprentice Years 1905-1918, vol. 1 of The Complete Prose of T. S. Eliot: The Critical Edition. Co-editor Ronald Schuchard. T. S. Eliot: Apprentice Years 1905-1918, vol. 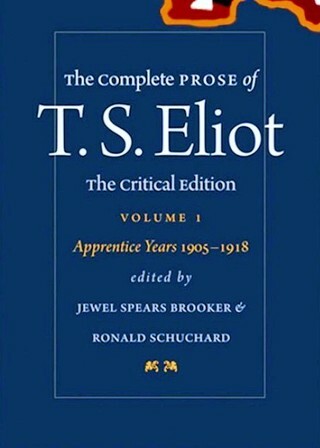 1 of The Complete Prose of T. S. Eliot: The Critical Edition. Co-editor Ronald Schuchard. Apprentice Years, 1905-1918, includes all surviving prose from Eliot's years as a student and from his first three years as a literary journalist. Spanning the most formative period in his life, the collection begins with a story composed when he was a sixteen-year old student in St. Louis and ends with a review published when he was thirty and an established man of letters in London. The volume contains twenty-six previously unpublished essays in philosophy and nearly one hundred pieces published in periodicals but never collected. The first part features stories and reviews written while Eliot was a day student at Smith Academy and an undergraduate at Harvard (1905-1910). The second consists of essays in philosophy and ethics written when he was a graduate student at Harvard and Oxford (1912-1915), culminating in his doctoral dissertation on F. H. Bradley, here published for the first time in a critical edition. The third part includes his early literary journalism (1915-1918), beginning with pieces related to his credentials in philosophy and the social sciences and concluding with essays and reviews in little magazines published while he established himself in literary circles. Apprentice Years contains a detailed historical introduction that traces Eliot's intellectual development from broad interests in language and literature to intensive studies in Aristotle and F. H. Bradley to an informed synthesis of literary and philosophy in literary criticism. "One of the more significant reading experiences of my life ... a major recognition, after fifty years, of [Eliot's] contribution." "Among the important contributions .. is the basis it provides for evaluating ... Eliot's philosophical views. ... dominated by Aristotle, Kant, and Bradley, but among the most interesting [of the unpublished essays is one] on Henri Bergson ... one of multiple instances in which excellent scholarship by ... Jewel Spears Brooker rescues an important text from inaccurate dating. Assigned ... by a librarian to the 1910-1911 period of his residence in Paris, the text is reassigned to the end of 1913 by Brooker on the basis of internal content, handwriting, and marginal notations indicating the text was orally delivered. Of great ... interest is ... Eliot's critique of his fellow writers during the period in which high modernism came into being ... Pound, Joyce, H.D., Yeats, Wharton, Sitwell, Lewis, and the Georgians ... It is clear that the familiar allegation that Eliot dismissed women writers is untrue. ... laudatory assessment of H.D. ... Edith Sitwell [and] Marianne Moore ... [the last described as] 'utterly intellectual, but not abstract; the words never part from the feeling; her ideas, imageless, remain quite personal.'"